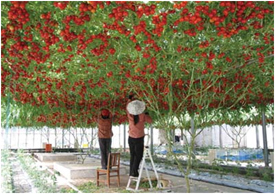 Tomato is a one of the most important vegetable crops in the world as well as in India. Tomato leaf curl virus (TLCV), Bacterial wilt and blights are major yield limiting factors in India. Considering its importance for fresh market and processing industries research programme has been designed to develop superior hybrids having high nutritive, valueslonger shelf life, multiple resistances coupled with high yield.